What’s a word that starts with A and contains a P and then an L? Maybe you thought “apple”, but how about “application” or “anthropology”? If you’re looking for a new kind of word puzzle, you should check out PDQ: The Pretty Darn Quick Word Game, by Jay Thompson. GameWright publishes this creative wordsmithing game. The rules to PDQ are simple. The dealer lays out three cards, each with a letter. 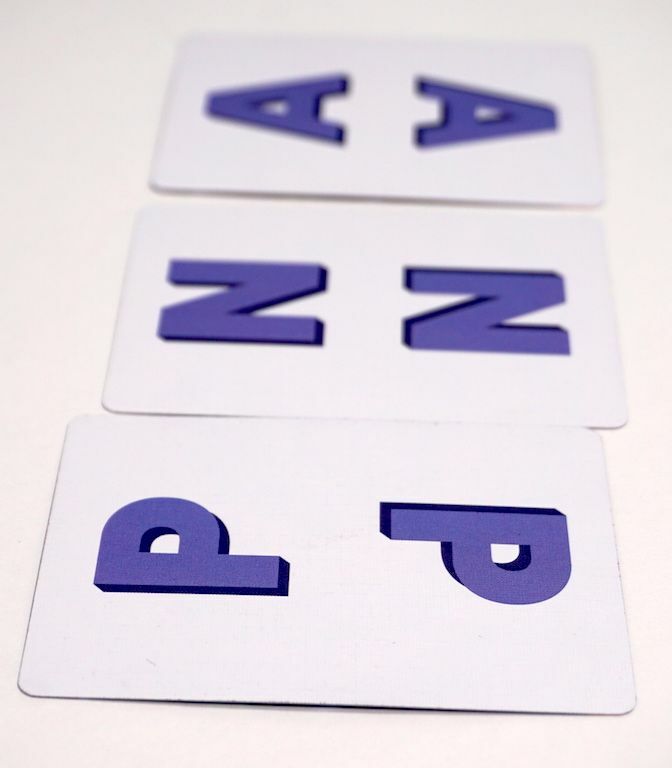 Once all three cards are laid out, all players simultaneously try to think of a word that includes those letters in order. The word can contain the letters from left to right OR right to left, but must start with one of the outside letters and continue in order. Words do not have to end with the other outside letter, and may contain any number of additional letters between or after the cards. Words must also be at least 4 letters. Other rules will be familiar to aficionados of word-building games: no proper nouns, no abbreviations, no foreign languages. The first player to shout out a word wins the three cards, as long as their word follows the rules. In the case of ties, the longer word wins. If it’s still a tie, or if no word was possible, the cards are set aside and the winner of the next round receives the cards. The game ends when all cards have been dealt. Players count the cards they have been awarded, and the player with the most cards wins. PDQ is a solid game. We’ve played other word games we enjoy more, but none are as well suited for a mixed-age group without adjustment. The rulebook contains several variations to adjust the difficulty for younger players or shift the rules for multi-generational play. It’s this versatility of use that elevates PDQ above other word games. Even though the basic rules make it a speed game, rewarding the first person to come up with a word, we found it easy to shift the rules to suit the personalities of the players. You could keep playing to try for the longest word with the given letters. Or stagger the difficulty by requiring adults to use words of at least 6 letters, while the children may use any length that fits the other rules. Why not try a written variation, rewarding the person who comes up with the most words using the letters within 2 minutes? The rulebook even suggests a way to play solo. Since it’s so easy to modify the rules, we’d highly recommend PDQ for a family looking to dip their toes into word games with their children. It plays simply, transports easily, and is incredibly quick to set up and clean up. If you don’t mind some shouting, it would make a great restaurant game. You can find PDQ for around $10 on Amazon or at your friendly local game store. The Family Gamers received a review copy of PDQ from Gamewright.